Geneva, 10 September 2018 – There is a 70% chance of an El Niño developing by the end of this year, according to the latest update from the World Meteorological Organization (WMO). Its intensity is currently uncertain, but a strong event appears unlikely. 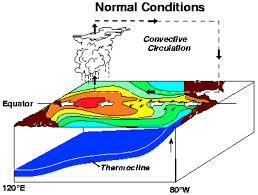 The El Niño/Southern Oscillation (ENSO) is a naturally occurring phenomenon involving fluctuating ocean surface temperatures in the equatorial Pacific, coupled with changes in the overlying atmospheric circulation. It has a major influence on weather patterns over many parts of the world. Scientific progress on the understanding and modelling of ENSO, underpinned by major observational programmes, has improved monitoring and prediction capabilities, helping society to prepare for the associated hazards such as heavy rains, floods and drought. ENSO also affects global temperature. “Climate change is influencing the traditional dynamics of El Niño and La Niña events as well as their impacts. 2018 started out with a weak La Niña event but its cooling effect was not enough to reduce the overall warming trend which means that this year is on track to be one of the warmest on record,” said WMO Secretary-General Petteri Taalas. “Despite the recent “ENSO-neutral” conditions, the globe broadly continued the trend of warmer than normal conditions for May to July, accompanied by extreme weather ranging from record heat in northern Europe and devastating flooding in Japan, India and southeast Asia. Many of these events are consistent with what we expect under climate change,” said Mr Taalas. “WMO does not expect the anticipated El Niño to be as powerful as the 2015-2016 event, but it will still have considerable impacts. The advance prediction of this event will help save many lives and considerable economic losses,” said Mr Taalas. WMO’s Update is based on forecast models and expert interpretation from around the world. It provides authoritative information to disaster, health and water managers and to climate-sensitive sectors such as agriculture, fisheries and energy. It is used by decision-makers and planners within governments and within the United Nations system. For the first time, WMO accompanied the El Niño Update with a global seasonal climate outlook for the September-November season, based on an ensemble of global prediction models run by WMO-accredited centres around the world. Possibly due to the weak strength of the expected El Niño conditions during the season, the precipitation patterns predicted resemble those normally associated with El Niño in some, but not all, of the ENSO-sensitive regions. A tilt of the odds towards above-normal surface temperature is forecast in nearly all of the Asia-Pacific region, Europe, North America, Africa and much of coastal South America. Many – but not all – of these regions also saw above-normal temperatures during May-July 2018. Much of North America, Europe, North Africa, East Asia and the Middle East saw temperatures 1-3 ° C above normal. Exceptions to the expected above-normal temperatures include much of interior South America, Greenland, many of the south Pacific islands and part of the Caribbean. Below-normal precipitation is expected in Central America and the Caribbean, parts of southern Asia, eastern Asia and the Pacific. Above-normal precipitation is favoured in part of southern North America, southeast equatorial Africa, the Gulf of Guinea region in Africa, extreme southeastern Europe/southwest Asia and small portions of interior South America. The September-November forecast indicate a probable continuation of the observed dry anomalies in East Asia and the Pacific, Central America and the Caribbean. Elsewhere, the forecasts generally do not show a continuation of the precipitation anomalies observed in May-July. In northern hemisphere winter, drier than normal conditions are typically observed over south-eastern Africa and northern Brazil. Wetter than normal conditions are typically observed along the Gulf Coast of the United States, the west coast of tropical South America (Colombia, Ecuador and Peru) and from southern Brazil to central Argentina. Parts of eastern Africa also usually receive above-normal rainfall.